I have been trying to expand my knowledge of NWN2 over the last few days, from scripting another GUI, to examining the conversation tool more, and even looking at custom content tools. The latter, however, is still evading me at the moment, as I am finding it hard to find any tools that may be "easy" to use or learn. I have downloaded Gmax, but have yet to try that, and from what I have seen and read, it may well be beyond me without a helpful tutorial. I have spoken to Amraphael of Zork fame (who is obviously someone most competent when it comes to custom content creation) and he said he would see what he could do if he got the time. (Thanks Amraphael.) By the way, if you have not done so already, check his site out, it really is an interesting read and the game he is developing (his own variation on Zork) looks like it will be a fascinating module to play. This new GUI is part of an idea I had of trying to help players remember certain aspects of the campaign by giving a small test at the end of an "act" of play that rewards the player's PCs according to how many questions they answer correctly. It is only meant to be a bit of extra fun, and the player can choose to ignore the test altogether if they want to. However, if a player has been paying close attention to the game and is able to answer a number of the questions, then they will be rewarded with game XP for the PCs. I have also added the option to "save" the current test for a short while so that they can do extra research before submitting their answers. There are a maximum of ten questions per test, but some may be less. The current reward is 10 xp per character level (main PC) for each question answered correctly. Geoff Cordery (a.k.a Quillmaster) has also been helping me with a few designs of other background images for the combination chests. Rather than give any screenshots now, I will leave them as a surprise when in-game. In return, I have been helping him with some scripting of his PC death code. It's great when you can return the favour for something like this. Until recently, I have neglected looking more closely at the way NWN2 handles conversations, and I have to say, much to my own loss. Having spent more time looking at them, I can see how many of the more common requirements for a conversation can be handled a lot simpler than the way you had to do it in NWN1: Quest logs have a direct input, nodes have camera selections for easier cutscene development and there are a number of 'common' condition and action scripts already written for a builder to access for each node. Now that I have studied them more, I will try to take advantage of them and have already started to outline one of my 'cutscene conversations' to use as an introduction to the module. 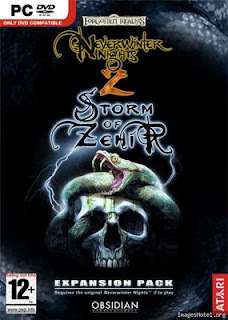 There was more news about the new expansion due out later this year (so I have heard rumoured), called "Storm of Zehir" posted on the Obsidian Blog. It reads that they have added quite a few interesting differences, including changes to the world map and concentrated more on a party than an individual with companions. From a scripting pointing of view, I hope this does not alter things at all, otherwise it could mean a nasty 'fly in the ointment' for some of the coding I have already done for the next module. There is a Pre-release Forum for the expansion at the Bioware Forums that has some interesting posts about the expansion: The overland map and battle. I also found this Official Website for the expansion. UPDATE: Here is a direct video link . Many of the main 'mechanics' I wanted in place: death system, vigour & rest system, crafting system, weapon system and Arcaene Lore system are mostly incorporated now, even if only at the outline stage. That is, they work, even if I need to flesh them out a little more. The Life Essence system fits in around many of the mechanics, but also expands on many other elements of the game, including such things as Combination Chests for example, and is something that I am continuing to incorporate and expand as I build. Another system that I want to add, which I have yet to even start, is the Soul Surges system. Without giving too much away, the new era has some elements of a different magic system breaking through. These breakthroughs take the form of Soul Surges, and allow spell casters to produce spell-like effects by use of their soul rather than other energies. I have had some preliminary ideas for some time, but have yet to expand on it. However, I can say they are powers that are over and above normal spell use and are powered by something akin to mana (and may still be mana at the end of the design) and can be used alongside the normal spells each day. They are not unlike At Will Powers in the 4e D&D manuals, but at this stage, I only intended them to be for spell casters and I still say they will need a power source of some kind. As you can see, I have made some progress over the last few days, although not as much as I would have liked due to being distracted with bigger ideas for greater development that have drawn me back to the internet to try to improve my own building skills. It always feels like there is so much to do, and it's difficult deciding what to get stuck into first. I think my next move will be to either to write the code that determines how and where Life Essences can be found, or to try to sort out the first major cutscene. I almost forgot: I also wrote a couple more books for the module. One was simply designed to give more depth to the current area, and the other was an in-game device (once read) to help the player determine what role they intend to take when playing the game: A Channeler or a Harvester. I will explain a bit more about these two 'roles' in a later post, but maybe the titles give the reader a clue as to what the role may be about. I would have done, but I am having a great deal of grief with my computer over the last couple of days. :( I am not sure if its a hardware fault or a software one, but it keeps crashing with drwtsn32.exe for no apparant reason. It appears to be something to do with when I right click on an icon to try to do something with it (especially shortcuts), then the PC just goes haywire and AVG starts trying to scan and everything locks up. I don't think it's a virus, but even a 'surface' reinstall of Windows and back to SP3 has not resolved ths issue. As everything is so unstable at the moment, I am not able to get into the toolset to play. :( As soon as I can, I will send you a screenshot of the latest for you. As I may have to rebuild the computer from scratch, it may take me a while. Would you believe it! After wasting two days trying to sort this computer problem out, I resolve it five minutes after posting to you! There was something in a TEMP folder that was causing some of the problem and a corrupt shortcut had somehow come from something in that temp folder. I deleted everything in the temp folder and remade the shortcut and now, hopefully, all appears stabel once more. I really dislike it when I waste so much time over something like that. Still, at least that is sorted and I can get you the screenshot sent in the next few minutes. I will let you know if the nasty PC lets me down again. I'm glad you posted on my blog, as I'd not seen your blog before, and I must say that from what I've read and seen, I'm impressed at your work. As someone who has been avoiding custom content as far as GUIs and the like go, it's really interesting to see what people are doing with the interface. I'll definitely be checking back more often to look at your work! Funny enough, doing GUIs (at least to th elevel I do them) is really easy compared to doing other Custom Content. If you download my tutorial (link in the side bar), it will show you what I learned from having known nothing at all.